Dry River Beds are an attractive functional swale with naturalized stone landscaping. Native plantings along the edge and in the stone, adds biodiversity and vegetation filters in addition to the various sizes of stone aggregate mimicking a creek bed found in nature. Swales are depressions that follow the contour around the base of a slope natural or created, channeling storm water from one place to another. They filter runoff along the way through vegetation, such as mowed turf grass by allowing it to sink into the soil. Plants on a swale’s gently sloping banks—and sometimes down the center of the channel itself—take up much of this water. Fast-draining soil is also key. Bio-Swales are created with stone drainage and compost/soil mixes, planted with grassy or wildflower meadows that are not mowed. They are typically located along the edges of parking lots and roads to capture contaminated water runoff. French Drains are the addition of a perforated pipe laid in gravel underneath can help handle heavy water flow. A drain swale might carry gutter water from a house to a dry well, while a more substantial one could run along the base of a hill above a low-lying house to divert water around it. Rain gardens are strategically located low areas specifically designed to receive and soak up rainwater. They can be created at edges of driveways or near the roof to capture storm water and allow it to infiltrate naturally into the soil. Depending on the size of the structure and the climate where it’s located, more than 20 thousand gallons of water can pour off a roof each year. When rain gardens are properly designed, they divert that water away from basements and walkways. At the same time, moisture-loving rain garden plants allow storm water to be filtered and absorbed into the groundwater while providing beauty and wildlife habitat in small urban spaces. Rain gardens can include trees, shrubs and herbaceous perennials designed for the size of the site. Broccolo Tree & Lawn Care is knowledgeable in the use of rain gardens for natural purification of runoff water for parking lots and urban areas, in an effort to preserve groundwater quality. Rain gardens can reduce the amount of water—and the pollutants that rain runoff can pick up along the way—carried into storm water systems, instead of back into the soil to be filtered. Growing a wild flower meadow in your garden is one option for keeping things natural and low maintenance, but still very beautiful. Planting perennial wild flowers will bring year-on-year returns for beauty and a diverse habitat. Turf grass is a fixture of the American landscape. All that lawn mowing contributes to the nation’s oil consumption and pollutant emissions. According to the U.S. Department of Energy, turf grass is the nation’s largest irrigated crop, covering more than 40 million acres. Mowers consume 1.2 billion gallons of gasoline annually, about 1% of U.S. motor gasoline consumption. Mow infrequently to allow all grasses to grow taller in summer, during drought, and in shade. Stop mowing some areas. Steep slopes, wet spots, and shady areas are great candidates for planting low mow grass mixtures and wildflowers. If you have six to eight hours of sunlight a day, transform part of your lawn into a wildflower meadow. Plant shade plants for areas getting less than 6 hours of sun. Wildflowers provide habitat for insects and other small pollinating critters like honey bees, butterflies, and hummingbirds–providing nectar and host plants for the larval stage of certain butterflies. Meadows provide a way to reduce lawns that require mowing, fertilizing, and upkeep and to enjoy beautiful native flowers blooming from spring through fall. One of our specialties is building green roofs and walls. We have installed several large-scale projects for institutions and government agencies, as well as smaller applications like green office walls and shed roofs. Green roofs have a proven track record for reducing our carbon footprint, especially in larger cities. In addition, green roofs create new living spaces, improve aesthetics, create bird and butterfly habitat prolong the life of roofs, insulate from heat and cold, improve air quality, reduce storm water runoff and the urban heat island effect. Green walls remove airborne toxins such as volatile organic compounds (VOC’s) exuded by cleaning products, building materials, adhesives, paints and carpet. These can be up to ten times higher inside structures. Plants improve air quality significantly through photosynthesis. They make humans healthier by removing carbon dioxide that is harmful and releasing oxygen into the air for inhabitants to breathe. Studies have documented people have reduced stress and sick days, more creativity, reduced noise levels and electrostatic pollution from computers and appliances. Broccolo provides consulting as subcontractors to engineer firms and also directly with developers. We give presentations to town planners and architect firms. We have had contracts with the state, county, the city, several towns, colleges, medical facilities and developers. Broccolo provides design, renovation, wetland remediation, preservation and construction. Our full-time staff are environmentalists with varying degrees in wetland mitigation, conservation, sustainable landscape design, environmental services in addition to horticulture. 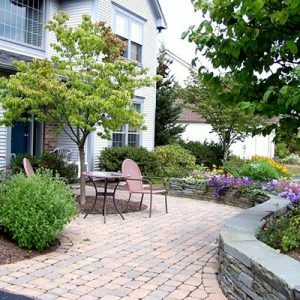 We are dedicated to environmental approaches in every aspect from carbon footprint to environmental diversity and have numerous awards from Cornell, FLCC, EPA, and Monroe County as leaders in the environment, along with the landscape industry. Broccolo Tree & Lawn Care is excited to offer Environmental Planning Services for commercial site developers, engineering firms, and even individual landowners who want a sustainable landscape that preserves and promotes the health of our native landscapes and waterways. We work closely with engineering firms to select appropriate plants and commercial landscape plans before they go out for bid. This review process ensures the proper plants are selected for each site, and that they are installed according to current industry standards. This results in fewer losses of plant material and a landscape that requires less pesticides to maintain. We at Broccolo are committed to preserving and restoring our environment and our communities. Please call if you’d like more information about our environmental planning services. Broccolo Tree & Lawn Care is committed to creating sustainable communities. In 2009, BTLC developed an ecological planning service for commercial and residential clients on “green” projects that qualify for LEED (Leadership in Energy & Environmental Design) credits. These best practices, developed by the U.S. Green Building Council, recognize sustainable building practices that save money, resources, and have a positive impact on health while promoting renewable, clean energy. Broccolo Tree & Lawn Care collaborates with engineers, architects, and developers to review commercial landscape plans before they go out for bid. This review process ensures that proper plants are selected for each site and planted according to best practices resulting in fewer losses of plant material, less labor, and fewer pesticides to maintain.